Mother Nature has many surprises for us and to really enjoy them, an excursion in the wild is the perfect recipe. Lone trees sprouting from the ground, the sound of birds chirping calling to each other and the sense of peace that engulfs you. That’s the best place for you to be—in the midst of Mother Nature’s many gifts to us. Hiking is a passion for many people. Spending time out there in the open and relishing the sense of freedom is what most people in cities yearn for. That’s why taking time off from their busy schedules and going off to enjoy the serenity is often their favorite activity. Going out in the wild is a remarkable experience. People enjoy the tranquility of their surroundings, which never cease to soothe and calm them. You might think that this experience might be the best thing to ever happen to hiking enthusiastic. It can be if it weren’t for the heavy backpacks. That’s the biggest issue with hiking and unfortunately it puts off many people from taking part in this refreshing activity. While out there in the open, hikers need some essential resources. Without them, their survival can be at stake. And that’s where the problem arises. Most of the hikers try to travel lightly but it’s almost impossible to do so. The only choice they have is to try and accommodate everything necessary in their backpacks. Needless to say, stuffing all the things in one backpack makes them too heavy to carry with ease. And for hikers, comfortable backpacks can make all the difference. If you too are faced with this problem, then you need to invest in the best travel backpack. All the qualities that you would expect from the best travel backpack are readily available in Venture Pal Lightweight Backpack. This is the epitome of convenience and simplicity. 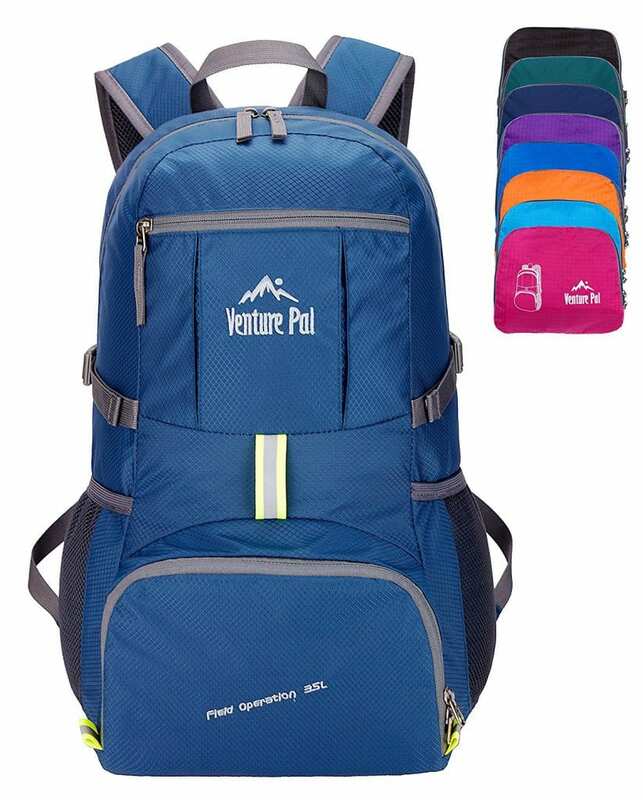 If you are looking for a hassle free way for handy storage, Venture Pal Lightweight Backpack is your safest bet. Size – It has the dimensions 20”x13”x7.5” when unfolded. Its compact size makes it a space saver. The easy to fold backpack measures 9”x8.5”x2.2”. When not in use, just fold the backpack and you can easily avoid overweight charges. It folds down to the size of a small pocket or a standard sandwich. Style – Venture Pal Lightweight Backpack is compact and handy. It has a roomy design. The style reflects the convenience and simplicity that the best travel backpack can provide. The backpack is available in different colors. So get the color that goes well with your luggage. The backpack offers two different styles. One with a flap and one without. Choose the style that appeals to you the most and enjoy the ease of use that the backpack provides. Quality – Durability of any product can help you determine its quality. It is durable and the brand has made sure hikers get the best out of the backpack. Stress points are most vulnerable and break down often. The backpack comes with all of the stress points reinforced with numerous bar tacks. They use 2-way abrasion resistant SBS metal zippers to ensure the longevity of the best travel backpack. Water-Resistant – The backpack is manufactured from high quality nylon material that’s water and tear resistant. Lightweight – The best travel backpack just weighs 0.7 lb. This lightweight feature is what makes it the favorite travel accessory worldwide. No more hauling heavy backpacks around on your travels. Comfortable Straps – The shoulder straps are made of breathable mesh and have plentiful sponge padding. This design relieves the shoulder stress that develops on long journeys. The shoulder straps can be adjusted. The whistle buckle on the chest strap helps securely locks your backpack in place. Multiple Compartments – The backpack features a main zipped compartment. Here you can store most of your essential resources, up to 35 liters. For additional space, there are two zipped pockets at the front. They are ideal for storing smaller stuff and provide easy access. You can store your water bottle or an umbrella in both the side pockets. Multipurpose – It is ideal for day trips, camping, hiking, travel and shopping too. Just get ready, unfold Venture Pal Lightweight Backpack and you’re ready to go. Easy to handle, convenient to use. Isn’t this what the best travel backpack offers? Why Choose Venture Pal Lightweight Backpack? When traveling abroad, excess weight is not an ideal situation. The backpack solves this issue for you. It’s lightweight and is made of water-resistant material. The compact size makes it easy to store when not in use. In short, Venture Pal Lightweight Backpack is the best travel backpack and a must-have travel accessory. In order to make the backpack lightweight, no additional padding is included in the lining. This means that the backpack has a rather thin lining. Some users found that to be a disadvantage. The zippers also didn’t work well for some users. Other than that however, the backpack is a rather remarkable product that provides convenience and simplicity. Venture Pal Lightweight Backpack has a plethora of features. The lightweight feature has made it a well sought out travel accessory. It is still considered the best travel backpack by many people who’ve used it. It does have some shortcomings but in the long run, it’s a convenient option that’s’ durable. So choose the simple way of living and use Venture Pal Lightweight Packable Durable Backpack for your next vacation.